Keep up with what the students are doing in the College First and Science First programs. Erica Rocha is a bright young woman who is going places in the career field of ecological research. Her participation in the Garden’s Science Career Continuum when she was a Chicago Public School student was an important step on her journey toward her future career as a scientist. The Science Career Continuum is composed of three programs: Science First for high school freshmen and sophomores, College First for high school juniors and seniors, and the Research Experience for Undergraduates (REU) for college students. Erica participated in College First in 2012 and 2013 and came back to the Garden for the REU program during the summer 2015. She is currently a junior at Dominican University, studying environmental science. As a college intern in the Garden’s REU program, Erica worked in the genetics lab and mentored high school student Mereida Fluckes. Upon our recommendation, this summer Erica made a courageous decision to apply for the Doris Duke Conservation Scholars Program at the University of California Santa Cruz (UCSC). Erica had never traveled out of the midwestern United States before. The Doris Duke Conservation Scholars Program (DDCSP) is a two-year program for college students to explore environmental conservation through field research in northern California. The program includes leadership and professional training. Twenty students are selected to participate in a summer intensive, field-based course focused on collaborative research and diversity in the field of conservation science. We were pleased, but not surprised, when we learned that Erica was selected to participate in this program. Her experiences in the Science Career Continuum put her at an advantage, and provided an excellent foundation for this kind of experience. Erica had a great summer and wrote to tell the program manager, Amaris Alanis-Ribeiro, about it. It is encouraging to hear that all of the time and effort we devote to students in our program, as well as continuing to stay in touch and advise to them after they leave us, is paying off! My apologies for getting back to you so late but I really wanted to take the time to write about my DDCSP experience (there is so much to tell!!). Starting from the moment I got off of the plane and on the way over to the UCSC campus, I was completely stunned by the differences in landscape, weather, and topography of the Santa Cruz and San Jose area. I’ve never really traveled out of state much, so being able to experience a whole new environment and ecosystem that isn’t close to home was so exciting and thrilling to me. That first day meeting everyone was overwhelming and I had no idea how close I would get to all of the scholars over the course of the summer. It was such a welcoming and comforting environment to be around them and the instructors because they share the same passion for conservation, social justice, and share similar stories as minorities and first generation students. Needless to say I’m grateful to have met all of them. We explored the caves in Santa Cruz. The very first night, Eric, one of the scholars who attends UCSC, took us to explore the cave on campus. I saw the UCSC mascot there (a banana slug!). It was a great start to the program. We spent the rest of that week learning more about the different ecosystems in Northern California. This included going to Año Nuevo State Park, Moss Landing State Beach, the Redwood forests (with HUGE trees! ), and a couple other places. I really enjoyed learning outside and placing all the textbooks’ concepts from back home into the field in California. I took a selfie while we were hiking to our campsite. After the first week on campus we headed to Big Creek Reserve in Big Sur for the ultimate camping trip. I’ve never seen such a pristine and pure environment in my life! There was hardly any human impact on the reserve—it is a great example of conservation and preservation of the land. And the water was like no other I have tasted! Another great thing was that we basically had the whole reserve to ourselves. Only the land managers and stewards were there. To top it off we placed our tents in the heart of the redwood forest and slept with the sound of the calming waters from Big Creek every night. I never thought camping could be so stress-free. Since our tents and kitchen were far from where the showers were, the creek was our go-to after a long day at the field. It was so refreshing and cold (which was great after being under the sun for hours). Our week in Big Sur was my absolute favorite. That is where we were introduced to the basics of research and started developing our own projects. This is where my interest in invasive ecology grew. One of the land stewards there, Feynner, is someone I really enjoyed meeting. He knows the reserve and the forest like the back of his hand. He was a great resource when coming up with research project ideas. He even invited me to come back if I wanted to do future research there. The next reserve, Sagehen in Berkeley, was probably everyone’s least favorite spot. We were really crowded along with other students studying there. But it was a good in terms of my research there. I was able to conduct a social science project concerning the loggers working on the sustainable forest-thinning project in the reserve. It was interesting to interview the workers doing the labor behind such an elaborate conservation project directly. It gave me a new insight into research from the social science perspective. The White Mountains in Northern California are stunning. Crooked Creek Research Station in the White Mountains was a close second to my favorite reserve. As at Big Creek, we were isolated 10,000 feet away from “civilization” as we liked to say. With limited internet, phone signal, and interacting with the same group of scholars, it allowed us to truly focus on our research. This is the place where we first attempted to write a formal research paper from a collective project. It was an interesting process to narrow all the possible research topics according to everyone’s interest into one single connected project. This is also where our statistical knowledge was very useful for analyzing the enormous amount of detailed data that we took. It was definitely one of the moments that encouraged me to continue my studies in ecology and research. Getting back closer to Santa Cruz, our last reserve was Swanton Ranch, where I got to collect data alongside cattle, herons, lizards, and a beautiful coastal view. I even got to substitute for a scholar in their project by helping guide a canoe in an estuary! Our final project here was the one we would present at the symposium in the Marine Lab on the UCSC campus. Having done the REU symposium at the Garden, I felt prepared and excited. We discussed diversifying the field of conservation. Once we were back on campus after spending weeks at research stations, we continued our discussions and workshops on diversifying the field of conservation. We had a lot of great workshop leaders who really encouraged me to fight for a more just and inclusive workforce, not only in conservation but in my everyday life. All in all, I came back with a sense of purpose to be more involved in social justice for minorities and with a renewed excitement for ecology and conservation. Being surrounded by such intelligent, engaged, involved, and passionate scholars and instructors, I can’t help but think how lucky I am to have been chosen for this internship. I am so excited for next summer’s internship with DDCSP. I’m so grateful that you told me about this program and recommended me, because without your support I wouldn’t be where I am today. THANK YOU! Erica Rocha is a former Science Career Continuum participant, current Dominican University student, and future leader in environmental science and social justice. She signed up for—and presented her summer research at—the Louis Stokes Midwest Center of Excellence (LSMCE) Conference this past October. On any given day, the Chicago Botanic Garden’s science laboratories are bustling with activity. Some of the researchers are extracting DNA from leaves, analyzing soil samples, discussing how to restore degraded dunes—and talking about where they’re going to college. The young researchers are interns in the Garden’s College First program, studying field ecology and conservation science, and working side by side with scientists, horticulturists, and educators. Science First participants gather data in the Greenhouse. Two College First participants work on analyzing samples in the Garden’s plant science labs. Science First, a four-week enrichment program for students in grades 8 through 10. College First, an eight-week summer internship for high school juniors and seniors with monthly meetings during the school year. Research Experiences for Undergraduates (REU), a ten-week summer research-based science internship supervised by a Garden scientist and funded through a National Science Foundation grant. In 2014, three College First graduates will participate. Conservation and Land Management (CLM) internship, offered through the Department of the Interior’s Bureau of Land Management and held in 13 western states. Graduate programs in plant biology and conservation, offered jointly with Northwestern University for master’s degree and doctoral students. The program is part of the Science Career Continuum, which is aimed at training the next generation of dedicated land stewards and conservation scientists. The Continuum engages Chicago Public Schools students from diverse backgrounds in meaningful scientific research and mentoring programs from middle school through college and beyond. “Each level of the Continuum challenges students to improve their science skills, building on what was learned at the previous level and preparing them for the next,” said Kathy Johnson, director of teacher and student programs. College First is a paid eight-week summer internship for up to 20 qualified students. Isobel Araujo, a senior at Whitney Young High School in Chicago, attended the College First program in 2011 and 2012. As part of the program, she did research on orchids and learned how to estimate budgets to fix hypothetical ecological problems. “It was definitely challenging, but it was awesome,” said Araujo, who plans to major in environmental studies. During the school year, College First students also attend monthly meetings that help them select colleges, complete applications, and find financial aid to continue their education. More than 94 percent of College First graduates attend two- or four-year colleges, and many are the first in their family to attend college. Three students, including Robert Harris III, received full scholarships to universities beginning in fall 2013. Science First and College First programs lead into other graduate and postgraduate programs. Visit chicagobotanic.org/research/training to find information on these programs. Conservation and Land Management (CLM) postgraduate interns for 2013 pose for a group photo at the Garden. Visit clminternship.org to find out more about this program. Because of funding restrictions, enrollment for the Continuum programs are limited to students from Chicago Public Schools. For more information, visit chicagobotanic.org/ctl/teacher_students or call (847) 835-6871. This post was adapted from an article by Nina Koziol that appeared in the spring 2014 edition of Keep Growing, the member magazine of the Chicago Botanic Garden. To some people, gathering in an auditorium on a bright summer day for a packed schedule of science presentations might not seem exciting. I will confess that once I was among those poor, unenlightened individuals. Now, I know better. REU interns from the Chicago Botanic Garden and the Field Museum gathered at the museum on August 16. All photographs are by Stephanie Ware, Field Museum research assistant. The reason I know better is because recently, I attended the Fifth Annual Undergraduate Research Symposium at the Field Museum in Chicago. There, college students participating in the Research Experience for Undergraduates (REU) program at the Chicago Botanic Garden and at the Field revealed some intriguing research findings about plants and animals. Funded through National Science Foundation grants, the REU program is held each summer, and hundreds of hopeful candidates from colleges and universities throughout the United States apply to the programs at the Chicago Botanic Garden and the Field Museum. Selected participants number only in the teens, and this fortunate group explores a diverse array of scientific topics related to plant and animal biology and conservation. They receive a stipend of $4,500 for the ten-week program, plus an additional subsistence and travel allowance. Though the stipend is much appreciated, the main benefit of the REU program is professional: these young scientists perform detailed research out in the field and within sophisticated laboratories, under the skilled mentorship of senior scientists and doctoral and master’s students. Along the way, they gain meaningful professional experience that will help them as they pursue further education and careers. At the Garden, for example, participants have access to the laboratories of the Daniel F. and Ada L. Rice Plant Conservation Science Center, equipped for research in ecology, soil science, genetics, reproductive biology, GIS, microscopy, population biology, geochemistry, isotopic analysis, and other areas of investigation. Some of the Garden’s REU participants use these labs while they serve as research mentors for teens attending Chicago Public Schools and participating in the Garden’s College First program. 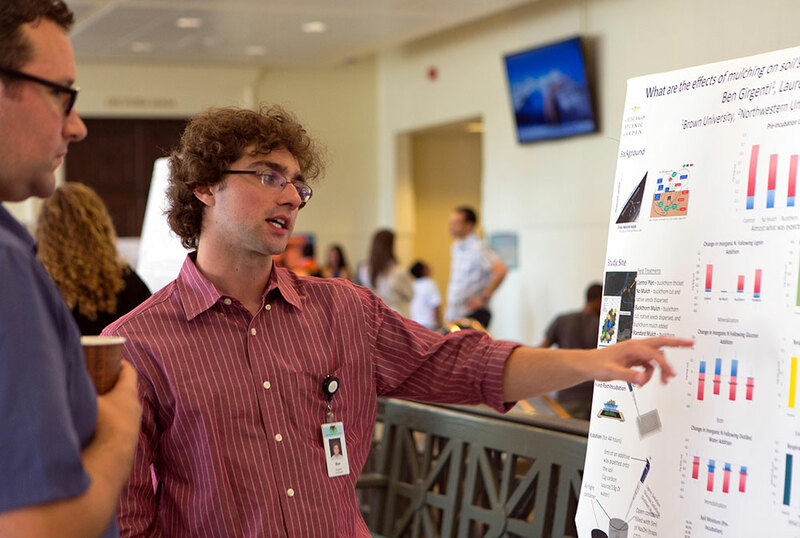 REU intern Ben Girgenti describes his project at the poster presentation. On August 16, after a rigorous summer of scientific exploration, the REU graduates gathered at the Field Museum to lay it all out. Kenneth Angielczyk, Ph.D., curator at the Field Museum, introduced the combined group of 17 presenters. “This symposium is the capstone experience of the REU program,” he said, noting that for many students, it was the first time they presented a talk in a scientific context. Dr. Angielczyk warmly welcomed the Chicago Botanic Garden REU participants, who traditionally have made their presentations separately, at the Garden’s Glencoe campus. “I hope this is the beginning of an ongoing collaboration going forward,” he said. 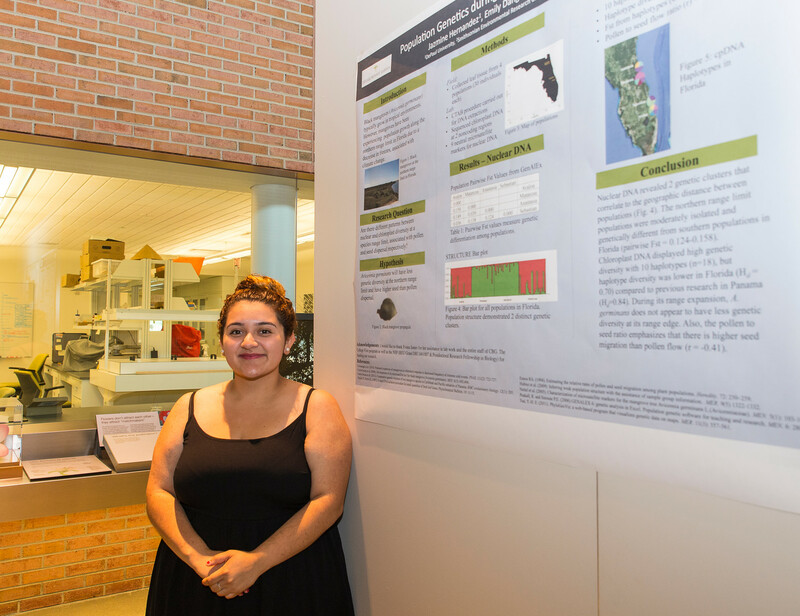 REU intern Rosalba Herrera explains her research at the poster presentation. One by one, the speakers stepped to the stage and described their work. The breadth of their research, and the significance of what these undergraduates concluded, was startling. (See the agenda, which lists their topics.) Through the focus of research varied widely, the subtext of climate change provided a sobering backdrop to many of the presentations. After a couple of hours my focus began to waver, but only because my caffeine levels had dropped. Fortunately, Stephanie Ware, Field Museum research assistant and REU symposium coordinator, had arranged for coffee and pastries between sessions. REU interns, families, and mentors take a coffee break and review poster presentations. 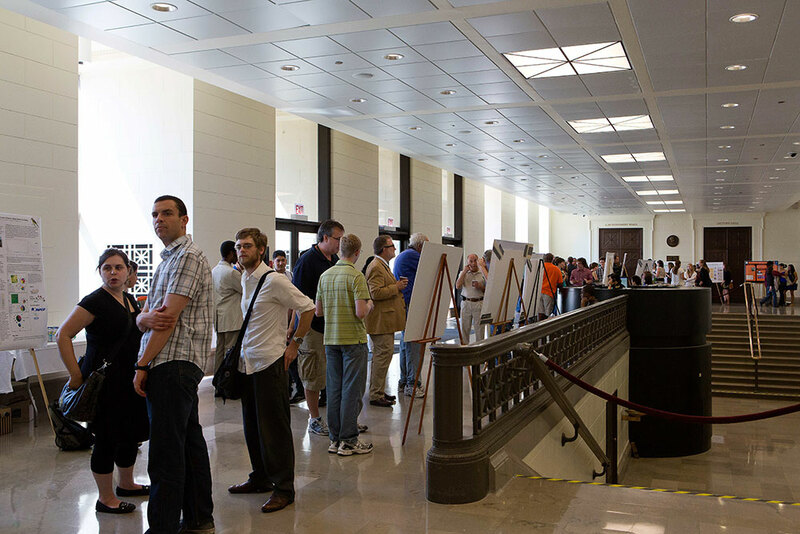 Soon I found myself perusing the poster presentations in the lobby, coffee in one hand and muffin in the other. (There may have been some healthy snack offerings, too, but if so I trotted by them too quickly to notice.) Nearby, REU participants, their families, and the scientists who mentored them mingled, and I overheard phrases like “mediated plasticity,” “fungal partners,” “phylogenic attributes,” and “bryozoan morphogenesis.” Then it was back into the auditorium for another round of presentations. 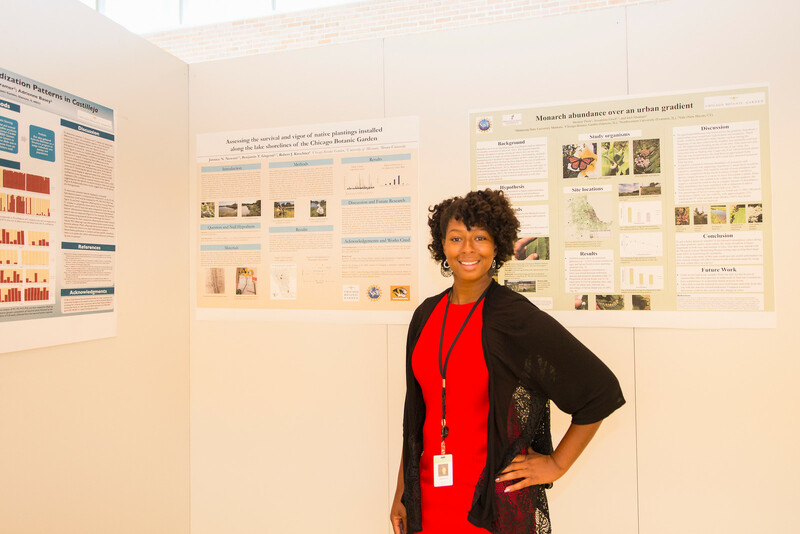 At the event’s conclusion, conservation scientist Jeremie Fant, Ph.D., the Chicago Botanic Garden’s molecular ecologist and laboratory manager, and coordinator of the REU program at the Garden, thanked the participants. He encouraged the students to consider presenting their summer work at other meetings. “Mentors and audience members alike are impressed with the caliber of your presentations today, which are worthy for presentation at any national science meeting,” he said. 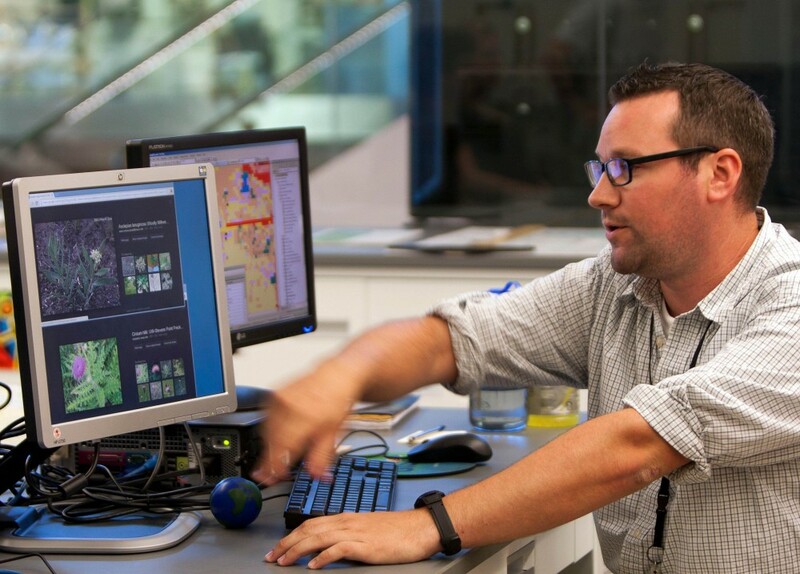 Meet the Chicago Botanic Garden’s 2013 REU interns. 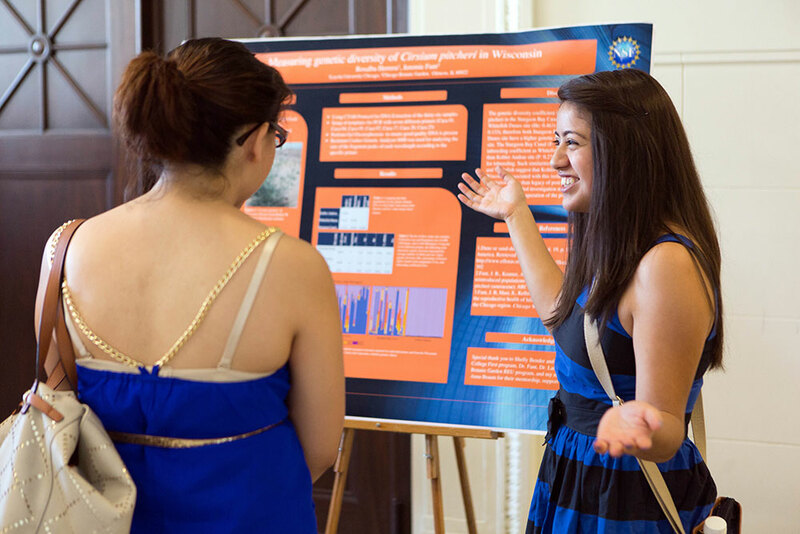 The REU program begins accepting applications in January 2014 for next summer’s program. If you are an undergraduate student passionate about plant science and conservation, consider applying to the Chicago Botanic Garden’s REU program. 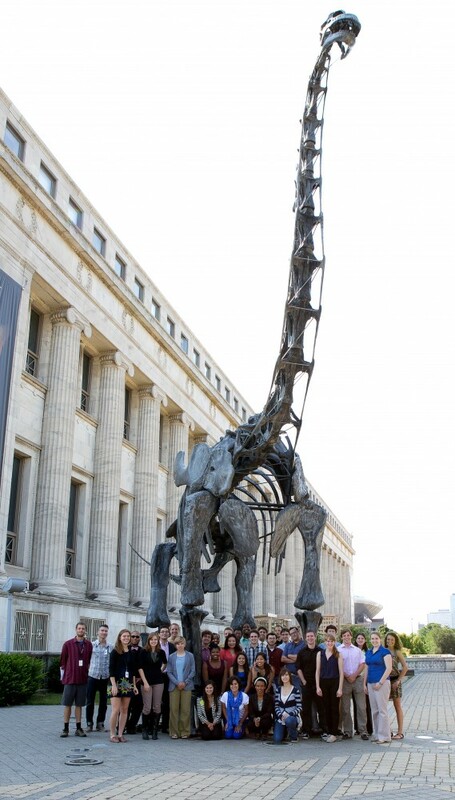 The Field Museum’s program also offers unique collections-based research opportunities. Both enable students to get involved in what Dr. Angielczyk described as “the real scientific process” through meaningful mentorships.